The aging of the face depends on several factors: heredity, lifestyle (sleep, exposure to the sun, cigarettes), medical and psychic health (harmful effect of stress) and stability of weight . 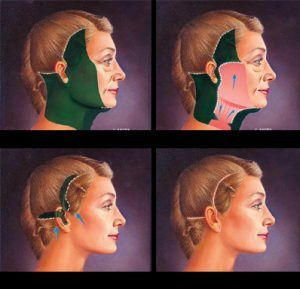 Historically, the facelift first deals with the effects of age by acting on excess skin. This traditional “lift” lift, that is to say, goes back in English, pulling and stretching the skin. During this operation, the surgeon drapes the skin without attracting too much, and therefore the skin retains all the qualities and creates a natural result. The surgeon simultaneously inserts the muscles at the level of the neck and the cheeks. The scars are placed behind the hairline, and behind the ears, so they are also discreet. This operation continued very little change of hair roots. The procedure lasts approximately 2h30 and takes place under general anesthesia. This requires a 4-5 day stay on site. During a classic eyebrow lift, the cosmetic surgeon will practice small incisions over the eyebrows (in the skin folds). In this way, it removes excess skin and it raises the eyebrows. It can also perform a lifting suspension using non-resorbable suture. He practices a small incision in the scalp (1cm) and a small opening (2mm) in the eyebrow. Depending on the quality of your skin, the surgeon may also decide to make a small opening in the hairy part of the temple. Subsequently, it provides subcutaneous access to the extremity of the eyebrow. On this way, it tightens and connects the connective tissue. This type of eyebrow lifting lasts about 1h30 and takes place under general anesthesia. This requires a 3 day stay on site. During an endoscopic eyebrow lift, the aesthetic surgeon practices an opening in the hairy part above the temple. The surgeon uses an endoscope (a small tube with a lighting device and a magnifying glass) to visualize the area to be treated and to perform the lifting eyebrow. Access to the extremity of the eyebrows will realize the skin, then the surgeon tightens and stitches the connective tissue. Initially, the treated area may be somewhat blue and swollen, but these disadvantages disappear spontaneously after a week. An endoscopic eyebrow lifting lasts about an hour. This eyebrow lifting takes place under general anesthesia. This requires a 3 day stay on site. During an endoscopic frontal lift, the surgeon uses an endoscope (a small tube with a lighting device and a magnifying glass) to visualize the area to be treated. First, it injects a special solution that promotes hemostasis. The surgeon practices a few centimeters inches behind the implantation of the hair. Through these incisions, the surgeon tightens the muscles that cause wrinkles and sagging eyebrows. It takes off the periosteum below these muscles and tightens it. By relining the skin from the forehead, it tightens the sagging eyebrows and eliminates much of the horizontal wrinkles. The periosteum is temporarily fixed by means of soluble sutures. Afterwards, the periosteum spontaneously attaches itself to the bone. The procedure lasts approximately 2 hours and takes place under general anesthesia, which requires a stay of 3 days on site. The procedure takes place under the muscles of the skin and the nerves, which guarantees a natural appearance. This intervention, relatively simple, gives back to your eyes all its expression of youth.